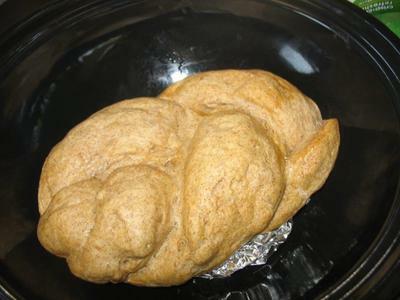 Around 11:00, I got a loaf of Challah rising in one Solar Hot Pot (the leftover dough from earlier this week). This time I brushed it with egg whites. Oh, my, it turned out wonderful! 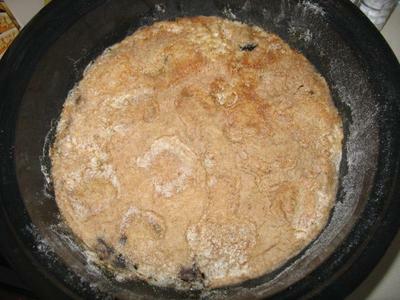 The top browned a little, and the top crust wasn’t dry at all. 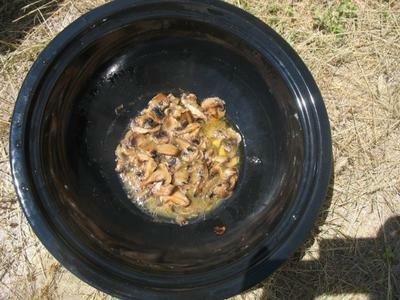 Around 11:15, we put out the extra mushrooms that weren’t going in the Chicken Hot Pot Pie, in our other Solar Hot Pot. I like to sauté all my mushrooms ASAP for less chance of going bad. Then I put them on pasta, eggs, etc. later. (Sometimes I just salt them and eat them plain!) Anyway, I forgot to preheat the butter and accidently put the butter and mushrooms out all at once. I stirred them around the 20 minute mark, and it worked fantastic despite forgetting to melt the butter first. There just can’t be an easier way to cook mushrooms; I love it!!! So my goal is to cook at least 50 different recipes by the end of October. The Chicken Hot Pot Pie was recipe #25, so I’m half-way there!!! 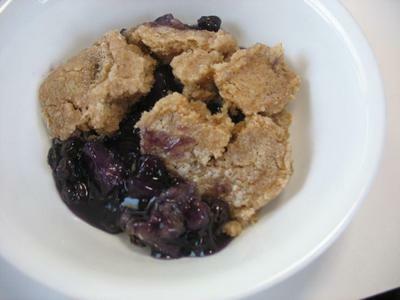 It worked out accidentally that I could “celebrate” the half-way point of new recipes with two of my favorite foods—chicken pot pie and blueberries. Someday when I get internet regularly again, I will enjoy reading others’ posts about this amazing journey called Solar Cooking!